MyGemewizard smartphone app is a groundbreaking digital color communication and grading system. Methodically reviewed and aligned with the industry-standard GIA® gemstone color description system. 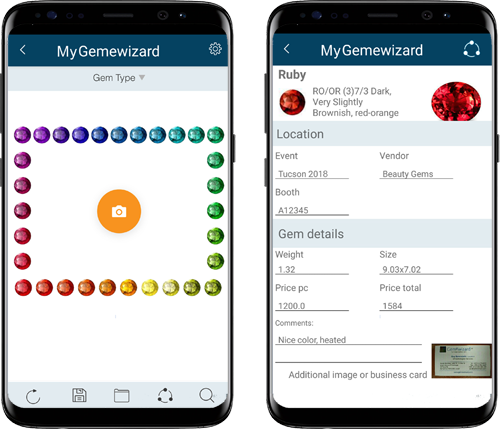 It has been designed to be used by the entire gemstone industry, from gemology students to jewelers, gem dealers and gem appraisers, enabling the standardization and communication of gem colors. MyGemewizard aims to streamline the trade, increase consumers' confidence and expand business opportunities. MyGemewizard is the perfect tool to have in gem shows and during buying trips. It enables users to record the details of gem items of interest, wherever and whenever they are encountered. The users may quickly and accurately capture (or upload) a gem image, identify its exact color, and communicate the information, together with additional information such as the gem vendor, the venue or event it was seen at, its asking price and other attributes, to a third party via email, sms messages, WhatsApp, etc. My Gemewizard displays a base palette of the 31 master hues - the most common basic hues of the visible spectrum - and the tone and saturation levels of each hue: making a total of 1146 gem color images. The database contains typical colors, grades and borders of over 50 types of the most traded gemstones. Gem colors are described using standard GIA® terminology and GemeWizard's alphanumeric color code.